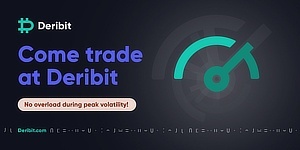 After taken a short pause, the crypto market has resumed its steady downtrend. With nothing happening in particular, the market is going its usual way, following the long term sentiment. 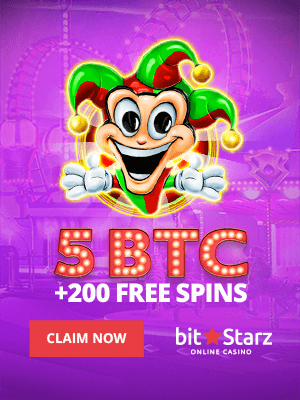 Some cryptos already approached their significant lows, while others are just trying to do so. Still, the time when all digital coins will make new fresh lows, may be quite near. 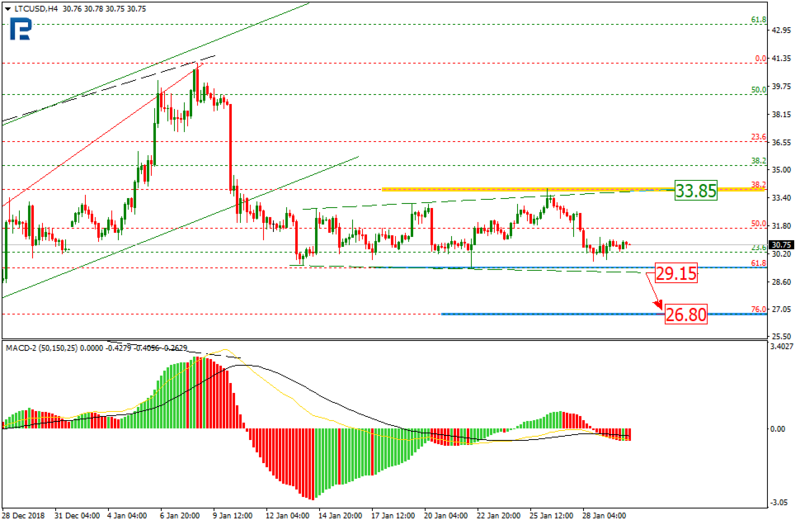 On H4, the BTC stopped correcting sideways and continued going down, currently reaching 76% Fibo. The next significant target lies at the $3,121.90 low. The MACD is meanwhile diverging, which may signal a pullback that could take place after bouncing off the $3,220 support. The target of such a pullback may lie at the short term descending channel resistance, or $3,570. 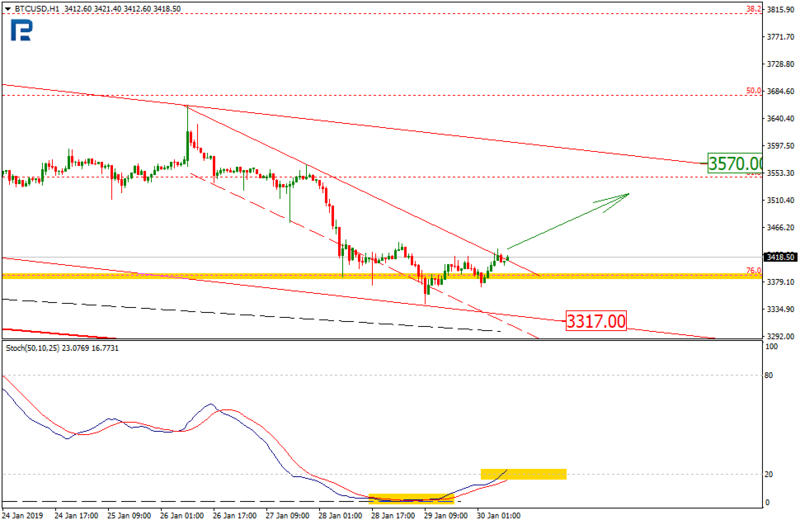 If this one gets broken out, the price may rise to the major channel resistance at $3,810. On H1, the BTC is trying to break out the local descending channel resistance. The Stochastic leaving the oversold territory may signal the short term rise is possible. Conversely, the price may go down to $3,317, too, and then bounce. 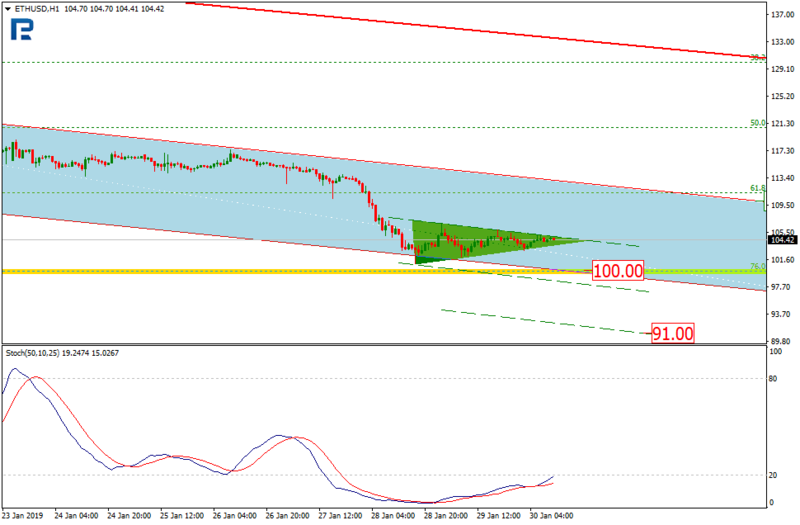 On H4, EOS went timidly down, reaching its lower low and forming a new descending channel. 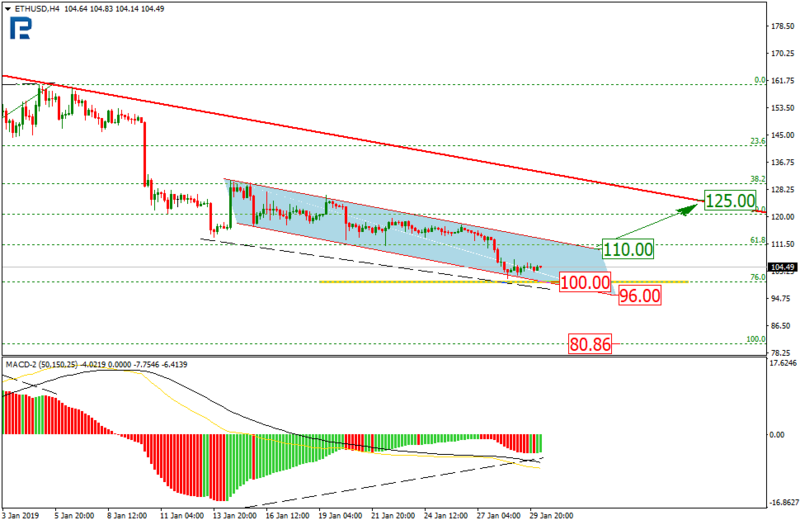 The price reached 61.80% Fibo and may now break out the support and fall to 76%, or $1.95. 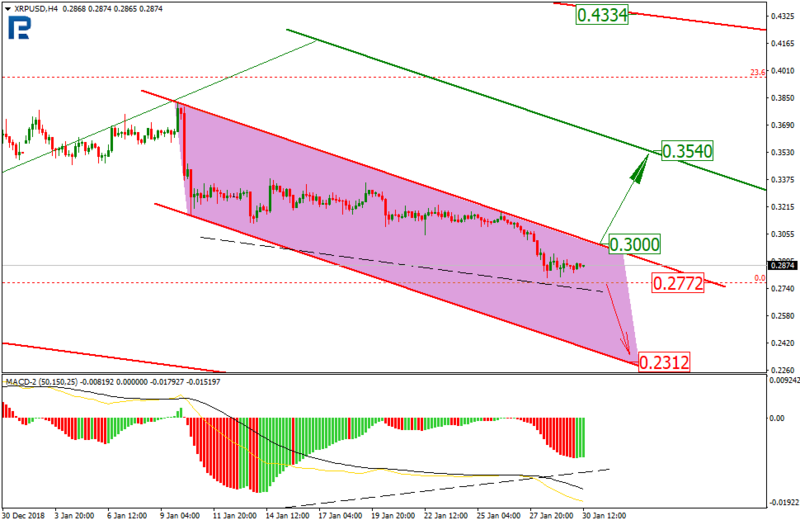 The MACD is converging, and once the target is reached, the price may rise to the current channel resistance at $2.21. On H1, EOS is forming a correction uptrend after the previous downtrend, well supported by the Stochastic. 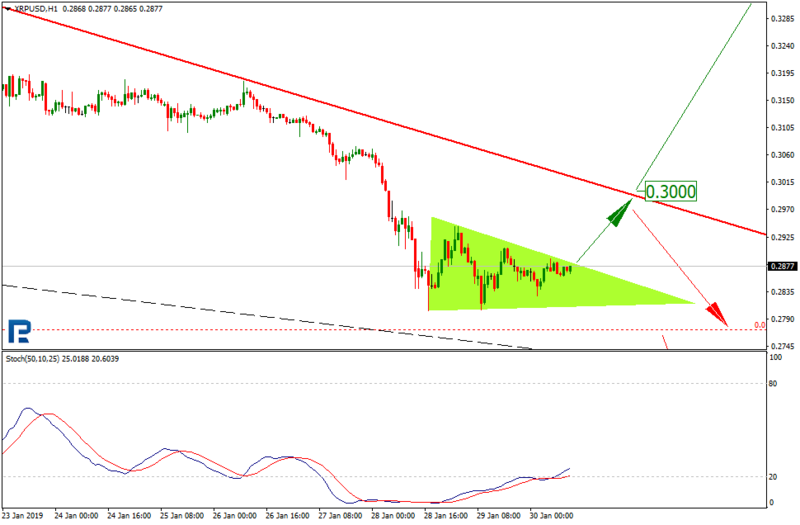 The target is around $2.38, and once it’s reached, the coin is likely to go down again to hit the support at $2.18. On H4, the Ethereum is well aimed for 76% Fibo, or $100, which can happen very soon, after which the coin may go further down to $96. However, the MACD is converging, which may signal a correction downtrend; this will be especially possible in case the price manages to break out the local resistance at $110, while the target could lie at the long term descending channel resistance, or $125. On H1, Ether has formed a consolidation triangle, and then may go both up to reach the resistance at $110, and down to hit the $100 round number and then $91. 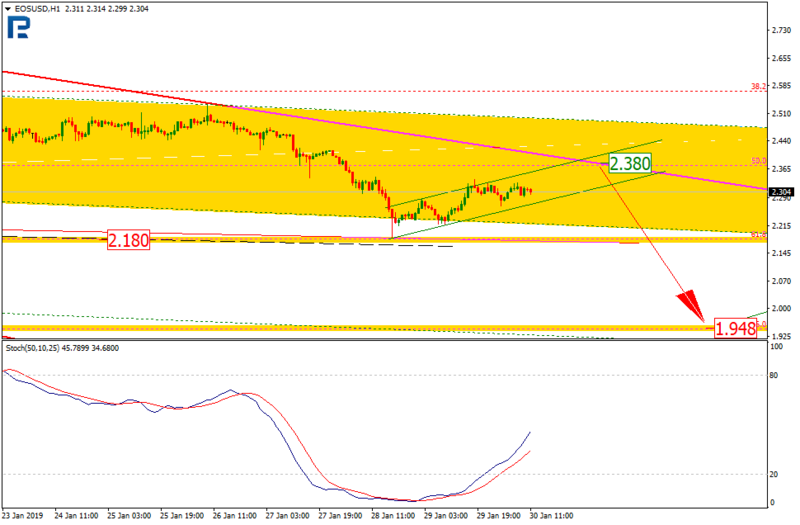 The Stochastic is moving upwards, which signals out an uptrend as a more probable scenario. On H4, the LTC is being corrected locally, forming a slightly widening channel. Most likely, the coin is aiming to 76% Fibo, which may happen after the $29.15 support breakout, the resistance being at $33.85. 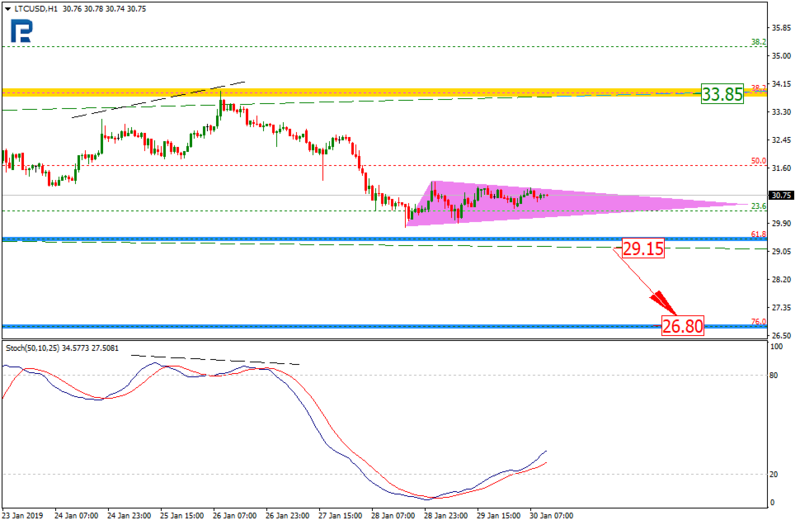 On H1, Litecoin is forming a triangle, which could lead to the price reaching the resistance area, with the Stochastic going up. On H4, the XRP price approached its major low at $0.2772. By going down, the coin updated its previous channel, which may now send the price to $0.2312 in case the low gets broken out. The MACD is meanwhile converging, which may signal that a correction is coming soon. 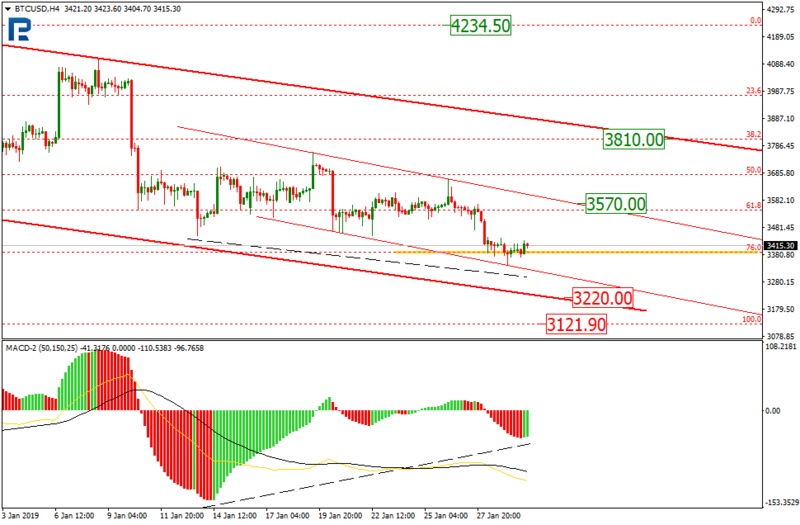 This will be surely the case if the price manages to hit the resistance at $0.3000, which could then lead to reaching the projection channel resistance at $0.3540. On H1, the XRP is forming a triangle, just like most other cryptos. 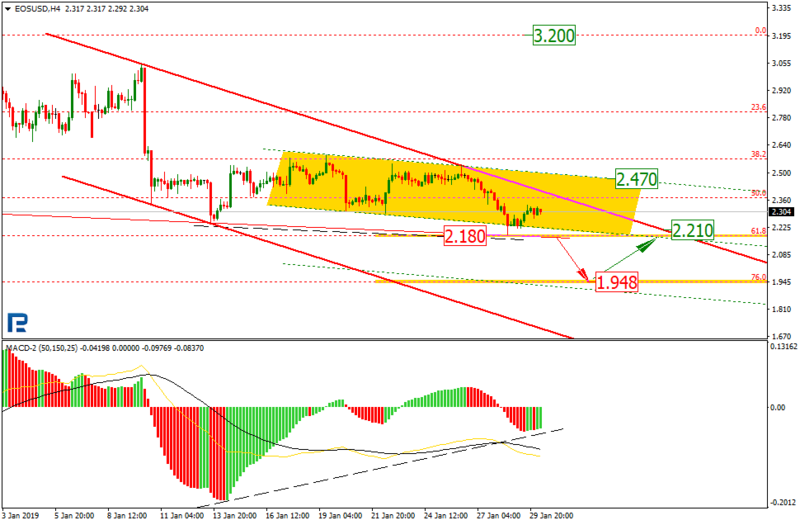 The Stochastic rising shows that the price could break out upwards to reach $0.3000, but then it is likely to bounce and continue downtrending.